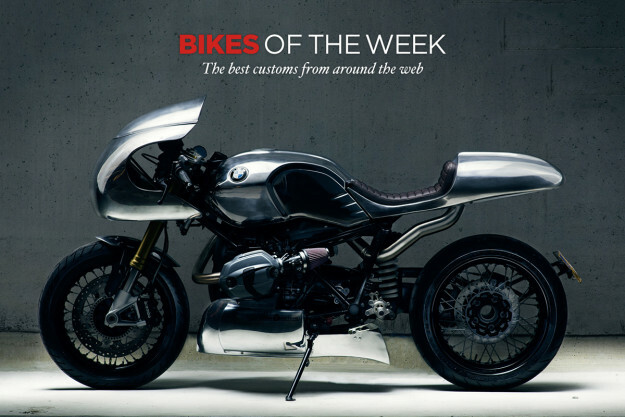 A slinky BMW R nineT from Holland, a candy apple red CB550 from the USA, and a Harley Sportster with a Norton Manx tank from Japan. Take your pick right here. 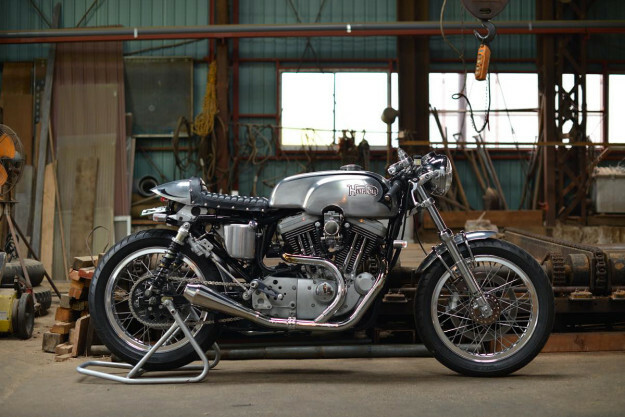 HPnineT Cafe Racer by High Octane. Everything created by Jeffry Sol and the Dutch High Octane team radiates speed. Like their absolutely mad, 1005 hp, Audi Sport Quattro, for instance. However, Sol’s clearest vision of velocity emanates from his latest creation: the slippery silhouette of this HPnineT Cafe Racer. Science suggests that symmetrical patterns please human eyes most. But the asymmetric detailing here is achingly gorgeous. 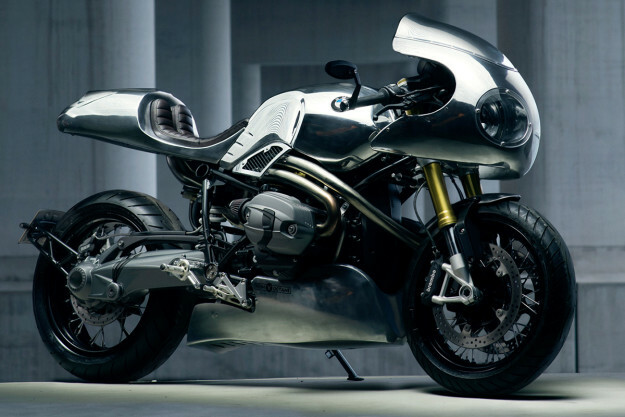 The tank, lower fairing, rear cowl, exhaust and headlight are all off-balance—and each of them worthy of a roped-off area at the Museum Of Modern Art. Every weld and panel was hand filed—twice. Once blended smooth, the bare metal was sanded for over a week before polishing to its current luster. 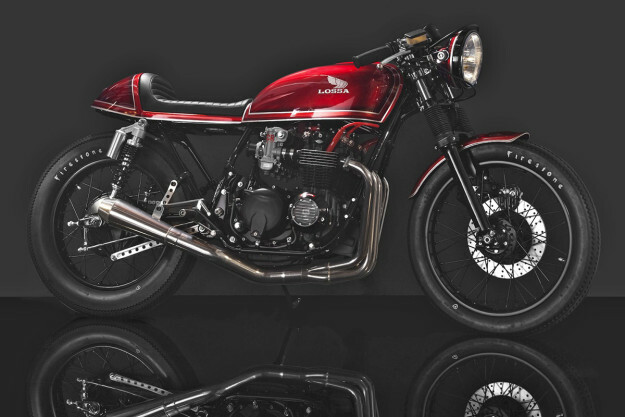 Honda CB550 by Lossa Engineering Jay LaRossa is renowned for sweating the small things. It doesn’t matter if the SoCal-based team are completing a one-off build, or developing a new bolt-on part—no detail is insignificant. Just lose yourself in this candy-apple red CB550 for a few minutes, and you’ll know what I mean. The finishing touches are exacting. For example, take a peek at the piggyback shock upper mount. The cowl was notched ever so slightly to make things fit—but its radial gap is as precise as the workings of a Patek Phillippe watch. Not a single line was disrupted. To show off the expert pinstriping (by Tom McSweeney from Kustoms Inc.) on the seat pan, the saddle was cored and upholstered with each tuck-roll lining up perfectly. Then every nut and bolt was either chromed or re-plated. But this CB550 is more than just a showpiece. The engine has been bored, ported and polished, and is now a fire-breathing 608cc mill. A Megacycle cam, Keihin CR carbs and a Lossa exhaust system were added. Then the beast was blacked out and bench-tuned to perfection. Gazzz Garage Kawasaki Zephyr Tracing its roots to the game-changing Z1, the Zephyr continued Kawasaki’s admirable trend of stuffing superbike engines into naked standards. Had the Zephyr line survived Y2K and the Mayan Doomsday, we’re pretty sure it would resemble this machine—an immaculate re-imagining by Nazar Poznyakovsky of Ukraine’s Gazzz Garage. 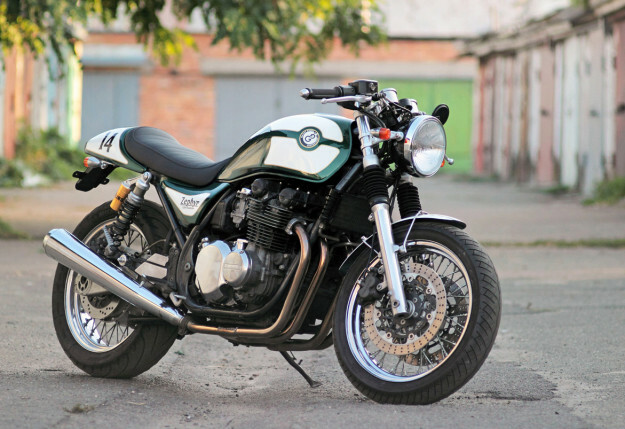 It’s only Nazar’s second build, but the Zephyr 750 looks like it rolled right off Kawasaki’s factory floor. Partly because Nazar had to park his grinder and maintain the OE frame configuration—and partly because everything needed to be done twice. This bike was built up using a 1991 model, and then dismantled and packed-up for a 3,000 km ride to France, where the parts were installed on the client’s 1992 Zephyr. 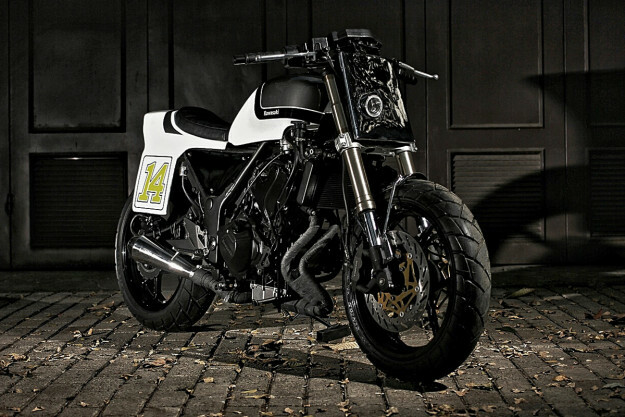 The Outburst by Studio Motor The latest build from Indonesia’s Studio Motor began life as an unassuming factory streetfighter. Regarded as not being tough enough, this brand new Kawasaki Z250 was completely stripped before rebuilding. And when the concept sketch was green-lighted by its owner, the Jakarta-based garage went to work. The tank and tail section are both completely hand-formed, using 1.2mm galvanized plate steel. The bench seat was also built in-house, and upholstered to give a flat tracker look. Handling was upgraded with a front-end swap from a Suzuki GSX-R750, and there’s a custom 2-into-1 exhaust system to boost grunt and sound. A set of Renthal Fatbars improve control, and new number plate/headlight combo finishes things off. Rocket-Boys SS by Berry Bads Bikes bearing the Bar and Shield have been on Japanese soil for over a hundred years now. So builders from every Prefecture have worked with Milwaukee’s finest. This XL1200 is a cut above, though, and comes to us from Berry Bads of Otsu in Shiga. Last week’s Harton leaned heavily on the British aesthetic, and ‘Rocket-Boys’ follows a similar vibe. The star is the tank, an aftermarket Norton Manx type lifted off a Yamaha SR. In digital ink, the combination reads unlikely and maybe even ill-advised: The tank, which had to be notched just to fit the breather for the big twin, looks dented. The seat and cowl appear as supple as cold granite. And the clip-ons sit low enough to warrant an on-call chiropractor.